Learn to say, "I'm pregnant," and find out how a man might question his connection to the matter. Learn to talk about fertility, pregnancy tests, and morning sickness. 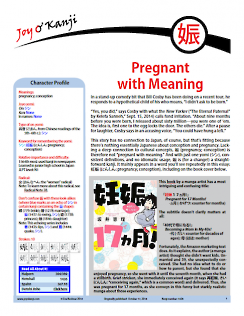 See how one manga artist managed to be pregnant for 17 months! Read about ceremonies in which doctors draw kanji (e.g., 犬: dog) on women's sashes. And discover a shrine that displays imagery of female genitalia.